It took me almost 8 months of planning and researching before I finalise my dream kitchen….phew. 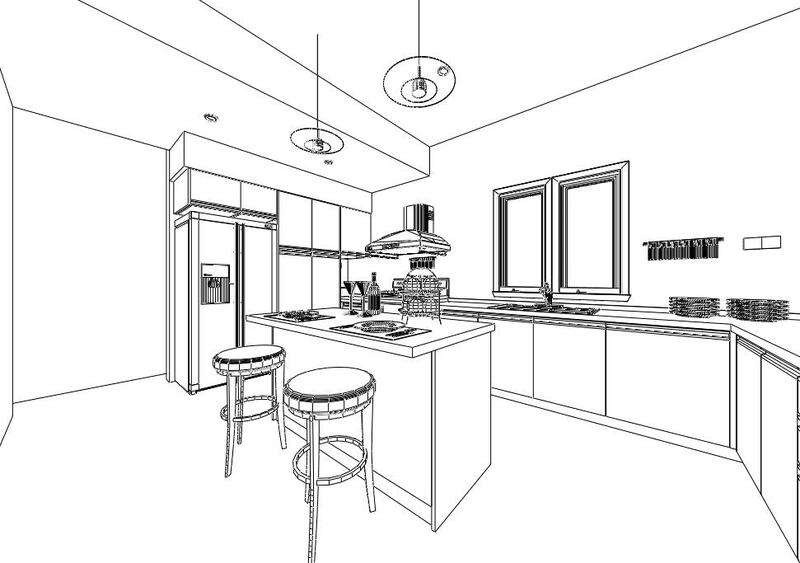 Ta..da.. my kitchen in 3D sketch. It doesn’t come in colours. I add them in myself. not a bad job too eh? hehehe… it’s quite close to the final color I wanted. Image of actual completed kitchen. To me, this is the most important item when building the kitchen. This is the surface where you will be preparing most of your food and subjecting it to your hot pots. It needs to be durable and wear lasting. There are many types of countertop available in the market. However, my opinion is that the best would be professional stainless steel or quartz stone. Both of these materials are highly resistant to heat and are largely food safe. However, stainless steel makes me feel like it’s more to industrial kitchen and I wanted a homely kitchen. So, the decision was made to go ahead with quartz. I refuse to give up having quartz countertop. So, when I found one company (HTrend) which offer it at RM 200 pfr during the promotion they have in HomeDec 2011, and in the colour which I can accept… I was very excited. Before I confirm with them, I actually demand to see the specification their quartz. It match quite closely with some of the big brands. And so, I was sold. I know this seems weird for many but being an engineer, I can’t abide with lousy mechanism. Therefore, I waste no time insisting all moving elements must be either Blum, Hafele or Grass. These are the only brand I trust. Most of the reliable kitchen cabinet makers would know these brands…but, sometimes, they cheat! They will buy you the “copied” version to pass it off. So, it is very important that you insist on their warranty. Not really my top priority as this would be easier to change in future (if you are sick of the colour). As for me, I ended up using matt polymer surface instead of the norm trend of gloss finish. Why? I am not a fan of reflective surface. I love the feel of matt surface. Htrend made mock up samples of the cabinet in the matt finishing in the 2 colours I requested before I make my final decision. It’s really important that you see how these colours are in bigger piece as sometime it looks very different in small size ! If your kitchen allows it, always go for the BIG sink. It would be even better if you can have 2 bowls. Remember, we do a lot of asian cooking and think of the size of the wok you use ! Can it fit comfortably into your sink? The next you need to be aware is the thickness of the steel use to fabricate the sink. Commonly, 0.8mm should very sufficient. But, if you can afford a better one, why not? J The thicker the steel, the more solid is will sound when you place your item in your sink. I really hate the ‘thang’ sound. So, I opted for granite sink. Muahahaha… And I think I got a pretty good deal. It’s from HCE. They claim it’s fromGermany. But, I normally take all these with a pinch of salt. Unless I see them participating in international market or they have international website, I am usually dubious about such claim. Nevertheless, it is made of granite and I love the overall outlook. 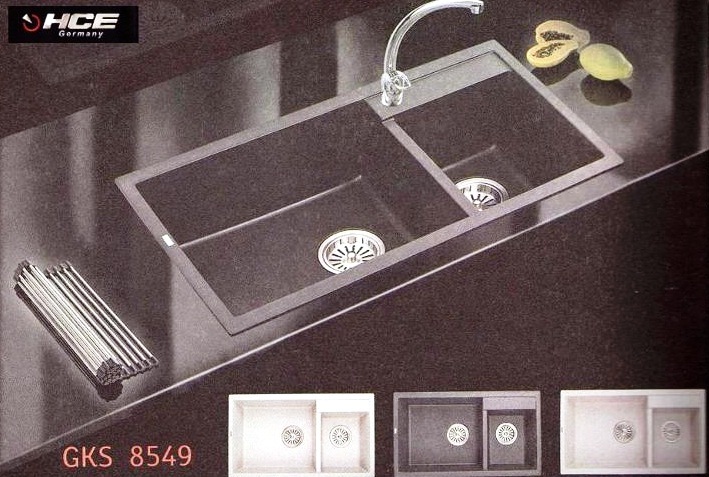 Not to mention, it’s cheaper than some branded steel sink, so, why not? (I grab this picture from Builder’s Hardware, where I bought my sink). To Read more about the sink and tap. Go here. As for the tap, I immediately decided I prefer the pillar style more than the wall-mounted type. Maybe it’s just my own reasoning… but I think the strength of the tap is better for the pillar style. Imagine this, you will be swivelling the poor thing very often. There are times where you might give it s tug. The strength of pillar is fully distributed along the length of the tap. But, for wall-mounted, it will be concentrated on the L-bend (abit like a fulcrum point). Now, all is left for me to do is to wait patiently for another 6-8 weeks !!! (oh my… time goes so slowly when you are waiting) before I get can see and touch my dream kitchen. I’m so excited already !!! Stainless steel is timeless. It’s so easy to maintain and much cheaper compare to the granite. I didn’t want it in my kitchen because I didn’t like the metallic sound when utensils drops onto the sink. Have you decide which you will get? Hi.. im planning to renovate my kitchen too. So what material did u use for your cabinet? Formica with matte finishing? The cabinet was with acrylic matt finishing… it’s pretty similar to Formica. I’m so glad I went with matt finishing… after 4 years plus, it’s still looking pretty new. Have fun renovating.